As summer marches on, it's coming up to Autumn which means harvest time. Lúnasa or Lughnasadh is an Irish (and other Gaelic nations) festival that celebrates the coming of the harvest. There are bands and music festivals of the same names with varying differences in spelling. 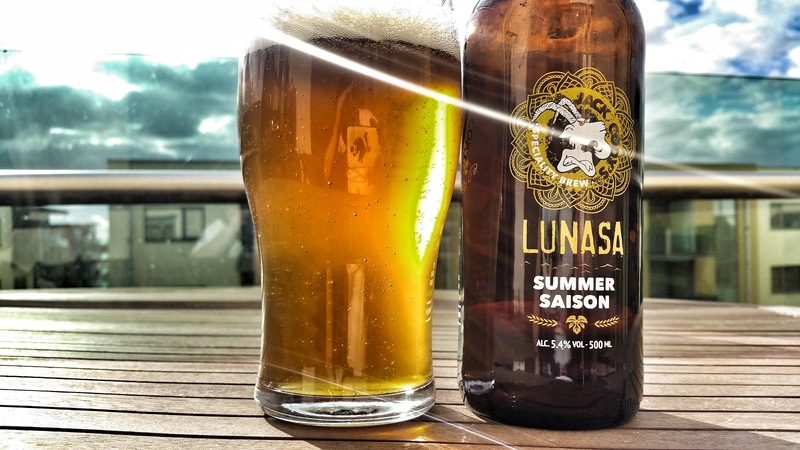 Lunasa is a summer saison with an ABV of 5.4 from Jack Cody's in Drogheda. I couldn't have asked for better weather in which to take the picture above. Now traditionally, a Saison was brewed in the winter for consumption in the summer so it typically ages for quite a number of months to allow the yeast do do interesting things to the beer. That was in the days before refrigeration of course. These days, you can brew a saison at any time of the year and this one was brewed at the end of May. Geoff sent me a couple of bottles along with a handwritten note. The yeast they used was very important and apparently they spent an absolute fortune on it. I don't know what strain it is but it's a traditional French saison yeast of some sort. How is the beer though? Well, it looks lovely in the sun. They used orange and coriander and that's pretty evident. The coriander levels are that of your typical Belgian witbier and some saisons but the orange is pretty hefty. While it's only 5.4%, it feels every bit of that and more, though it's not hot. I think it's more from the big body. It's one of the most peppery saisons I have come across too. It will go magically with white fish and certain cheeses. These aren't bottle conditioned by the way, they are unfiltered and tank conditioned. They get transferred into the bottle from the pressurised tank so there's little to no yeast to make your beer murky. The result is a mostly clear, golden sparkle that looks the business in sunlight. I should note that one of the bottles wasn't quite right. It was practically flat and very sweet, likely due to the lack of carbonation. I suspect there might have been a slight issue with the seal on the cap.